We thought about telling you why you should donate to Better Idaho, but then the far right-wing organization Idaho Freedom Foundation did it for us. In a fundraising email to his members last week, IFF President Wayne Hoffman said Better Idaho “…aims to turn Idaho even more toward progressive policies.” Then he said he’s ready for a fight. “Will you stand with fellow liberty-loving Idahoans as (we) prepare for battle?” he asked. We’ll leave the war analogies to Hoffman. 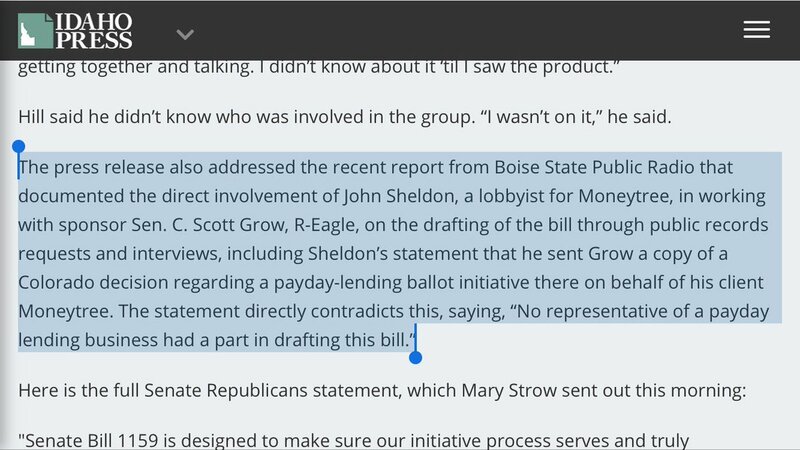 Instead, we’ll point out how his organization lobbied state lawmakers in the last legislative session. We believe that’s contrary to the values of most Idahoans. But the IFF isn’t debating Better Idaho’s public policy positions. Instead, the group is more interested in name calling and innuendo. We can handle it. But we need your help. Continuing our work spreading the message of responsible governance over ridged ideology requires support from people like you. Unlike the IFF, we don’t have a $780,000 war chest. But you’ll have to admit, little ol’ Better Idaho got Hoffman’s hackles up. Make a donation and help us do more. P.S. If you really want to annoy Wayne Hoffman, donate to Better Idaho.